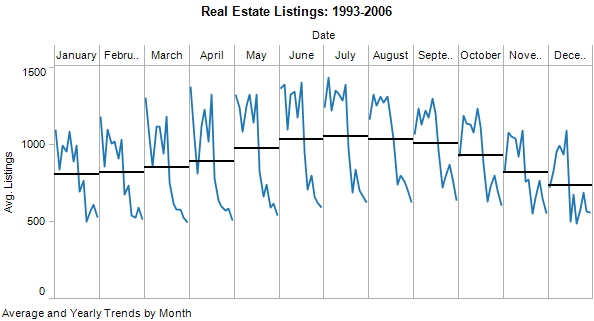 The January 2008 newsletter from Perceptual Edge is an excellent description of Cycle Plots by Naomi B Robbins Ph.D, which are a less known way to look at trend data. On her website, you can find a link that describes how you can create these views in Excel and provided the input data. I think it is great when people give you access to the data that is shown in examples. I used the same data to build a cycle chart in Tableau in a couple of minutes. Here is the packaged workbook, suitable to use with both Tableau Desktop and Tableau Reader (our no-charge application for reading and interacting with visual analytics). The workbook also includes the two other trends she talks about in her articles. All three views are useful and Tableau makes it easy to switch between them and get many other views as well.